When she was growing up, Danielle Town never liked the words finance, stocks, or portfolio. The daughter of the successful investor and bestselling financial author of Rule #1, Phil Town, she spent most of her adult life avoiding investing-until she found herself stuck in an all-consuming legal career where she felt both her money and her life were out of control. Determined to regain her financial freedom and put her money to work in a socially responsible way, Danielle asked her father to help her take charge of her future by teaching her Warren Buffett–style value investing. What began as a series of conversations between them eventually turned into a yearlong investing plan and the hit personal-finance podcast InvestED. Over the course of that year, Danielle went from being an extremely reluctant investor to knowing exactly how and when to invest in wonderful companies, with a little-okay, a lot-of advice and help from her dad. In Invested, Danielle tells the entertaining and educational story behind her personal life-changing journey to financial freedom. She lays out the twelve-month plan that she developed with her father, creator of the successful “Rule #1 Investing” method, to practice step-by-step the principles of value investing handed down from the wisdom of value-investment legends Warren Buffett and Charlie Munger, and she shows how those principles will reshape your finances and your relationship to money. With regular conversations and guidance from her financial-guru father, Danielle comes to understand that, despite her fears, investing to create wealth isn't about risking money, it's about not losing it. 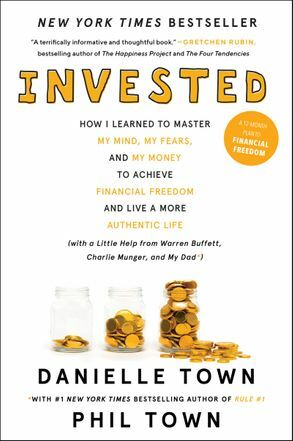 Avoiding overly complicated math and obscure financial models, she turns her father's deep investing knowledge into her own successful investing practice and, in the process, masters the difficult emotions many of us have about money and the stock market. Capturing how our feelings about money in the present often interfere with having a more prosperous future, Invested makes the complex world of investing simple, straightforward, and approachable, and will help you gain confidence and strategies to formulate your own plan for financial freedom-and put your money where your values are.